The next edition of the Auburn South Fair will be on Sunday 25 October 2020. 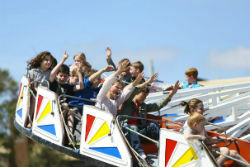 Supported by local families and businesses, the Auburn South Fair is a biennial event that attracts thousands of people from around Melbourne and the local Boroondara area. With rides and activities for all ages, a variety of stalls and a broad range of culinary delights, the Auburn South Fair has something for everyone. If you would like to assist the organising committee or to sponsor the 2020 fair please complete the form below.